Selling mulch is a time-honored tradition for a lot of Boy Scouts. But this year, the scouts of Troop 1970 in Reston, Virginia learned one of their longtime customers had died, and they sprang into action. Brad Wacker died a few months ago after a brief illness, and his widow, Winslow, misses him "more than I can say. It’s really, it’s been a shock to not have him here," she said. Winslow Wacker was left with a mantle full of memories. "Well, in the morning, I say, 'Good morning.' And chat with him and tell him I love him," she said, looking at the framed photos on her mantlepiece. 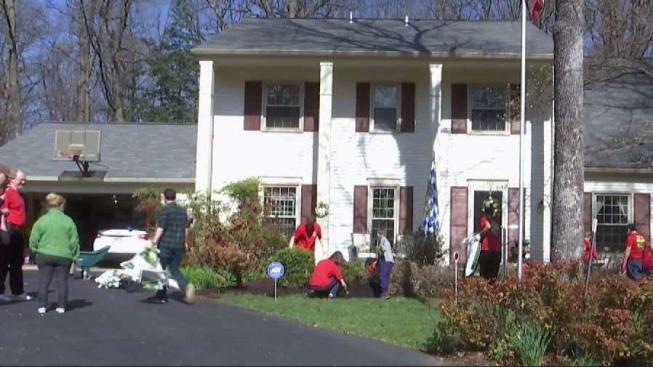 Now, she's trying to find a new normal and keep up their house in Reston like her husband always had. This year, she couldn't afford the mulch they always bought from their local Boy Scouts. But when the scouts heard, it planted an idea in their minds. "The troop offered to bring her the bags for free," said scout Alexander Rolinski. "Just out of kindness and because we felt that was the right thing to do." More than half a dozen scouts spread mulch and raked leaves for Winslow, doing what they can to lift her up in a time of need. "It's heartwarming to see this young generation, pitching in, helping," she said. "So polite, so nice. And I was just like, I wanted to cry." "I think everyone is gonna remember this for a long time and so I think it’s been a great experience for everyone and I'm glad that we did it," Rolinski said. Another scout, Graham McDaniel, said, "It makes me feel good to help people. 'Cause if they feel good, I feel good as well." Brad Wacker was a B-52 pilot. His wife says he always credited scouting with helping him get to where he did.